Very nice new tech shirt this year...and the 15K State Championship no less. 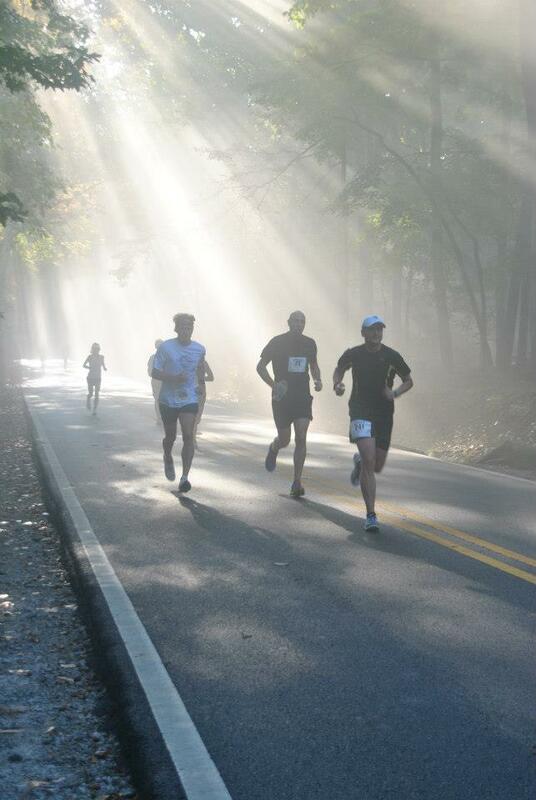 Yet another perfect day for a race atop the beautiful Monte Sano Mountain. However, unlike my usual adventures on the local mountain, this 15K race course is run entirely on roads. It starts and finishes inside the Monte Sano State Park. Runners are lead on a couple of out and back sections on State Park roads before exiting the park and entering the adjacent neighborhoods. While this is a road race, it is definitely a challenging course that leads runners along rolling hills throughout the entire race. 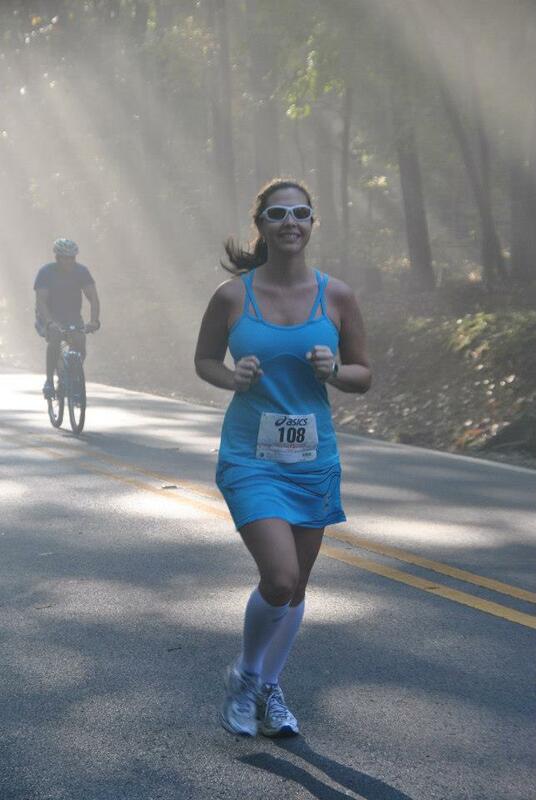 Me on a picturesque road section inside Monte Sano State Park just after the race start. Anya and I had registered for this race a couple of months ago as part of Anya's training for her first 25K race in Nicaragua in Februrary 2013. 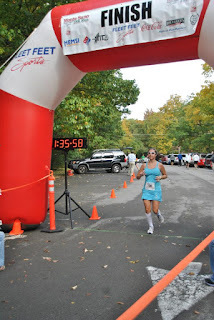 While she had been dealing with severe bone bruising and swelling in her right knee along with severe plantar fasciitis in her right foot, she still wanted to toe the line. I had offered to pace her, but she wanted to stick it out alone at a pace comfortable to her. I had sincerely hoped she would let me pace her as the alternative meant that I had to battle it out with my usual "foes". Anya looking very relaxed early in the race. When we arrived just about 30 minutes before the race start, the place was already buzzing with tons of people warming up and getting ready. It was foggy and just a little chilly, perfect temperatures for the race. I quickly spotted Jason Shattuck as well as Mike DeHaye. Oh boy, I really had hoped I wouldn't have to "man up" and try to race these guys. As it turned out, it wasn't much of a race anyway as both guys left me in the dust very early on in the race. As the race start approached, I decided I would try to stay with Jason as long as possible and if I couldn't maintain pace, I'd lust drop off and take it easy. However, I was still running with him with a mile to go, I was going to give him a run for his money. RD Mike O'Melia signaled the race start with the traditional musket (or whatever that riffle is called) and we were off. BTW, it was absolutely great to see Dink Taylor out there looking just like his old self (minus a few pounds). From what I hear, his recovery is going rather well and I am extremely glad to see and hear that. I was feeling pretty good very early on running sub 7 min pace. Jason was just ahead of me and Kathy Youngren and Dana Overton were just behind me. I figured it would only be a matter of time before they'd pass me. As usual, Mike had taken off like a rabbit. He never faltered and had a strong race. Congrats Mike! I kept Jason right in front of me, but at just 3 miles into the race, I started to feel pooped already. I immediately turned inside and started to argue with myself. "Why am I even out here? I just ran a 50K and a 100 miler just 3 weeks ago. I have neither the pace nor the mental fortitude right now to turn it on, so why don't I just walk it in. Seriously, who cares." Well, I care, so while I slowed down significantly, I decided to treat this as a tempo run. I allowed myself to slow my pace to at least talk to fellow racers or shout words of encouragement, but I more or less maintained this pace til the finish. 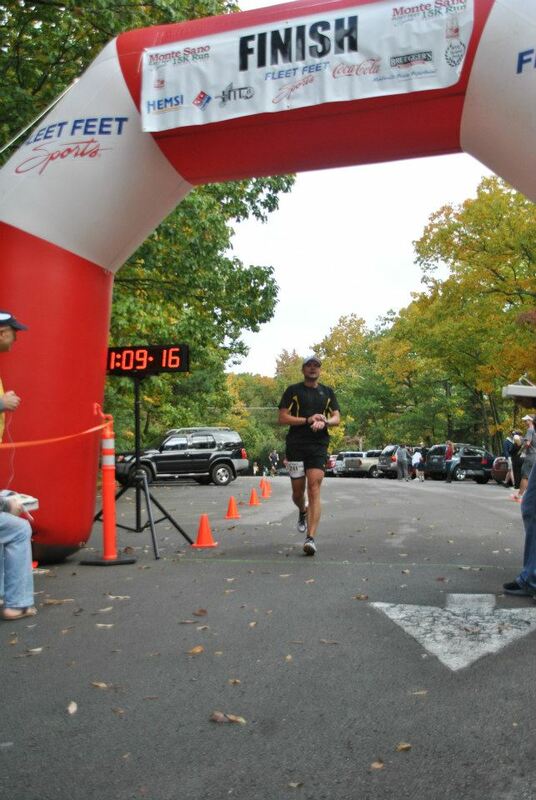 I crossed the finish line in 69 minutes, about 4 minutes slower than my goal. Oh well, it was still a course PR and a fantastic race nonetheless. I actually got to enjoy the scenery this time, able to take it all in. 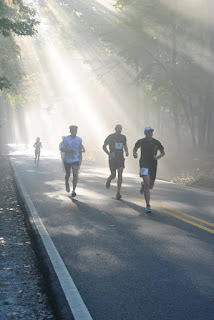 The view just after the start with the sun breaking through the fog and the trees and hitting road and us runners below was amazing. 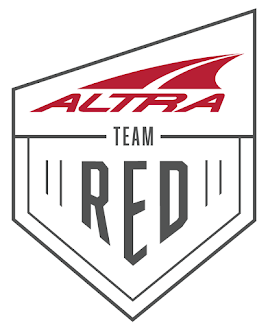 I look forward to running this race for the fifth time next year and hopefully, I get to battle it out again with my running buddies, cause this time it was no contest! Congrats to Jason, Mike, Andy, Kathy and all the other runners who finished this race. A special congratulations goes out to my wife and better half Anya for completing her first 15K road race and for doing it not only in style, but extremely well. Running negative splits on a challenging 15K road course like this one is no small feat. I am extremely proud and excited to see that her training and hard work is paying off. Nicaragua, here we come! 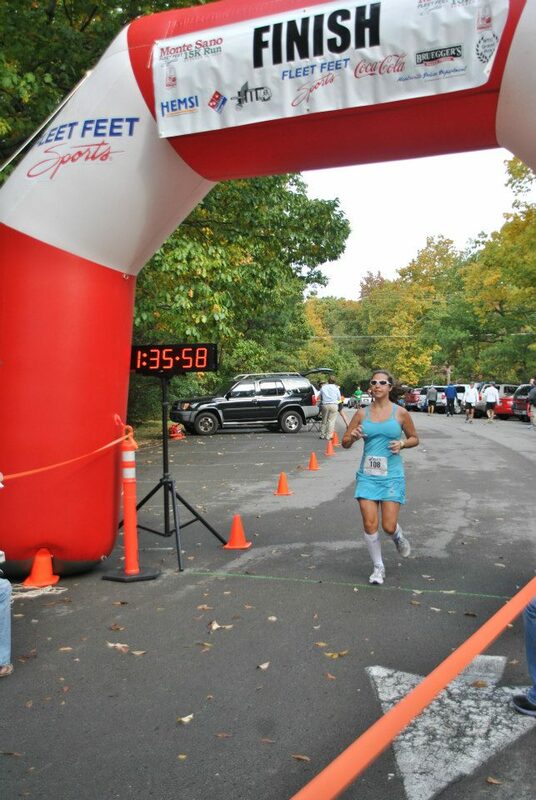 Anya crossing the finish line looking strong!